Jerry Joseph has been on the scene for over ten years now; first migrating to town with Rocky Mountain reggae/rock mainstays, Little Women back in the early ’90s. Since then, Jerry has flirted with the typical well-known career stalling vices over the years. But the cover and other artwork of this album, as well as some of the lyrics, seem to imply a shift for him, toward some sort of Eastern principle, falling somewhere in between an ascetic form of Buddhism and Hatha/Tantra Yoga. Whatever his personal philosophic bents, he has been off of drugs for many years now. His powers as a musician and songwriter seem never to have been more acute. Jerry and the band, drummer Brad Rosen and bassist Junior Ruppel, traveled to Georgia in August and September of 2001, to record for the Athens-based Terminus Records label, under the auspice of producer Dave Schools (bassist for Gov’t Mule and Widespread Panic) and engineered by David Barbe (who was bassist in Bob Mould’s Sugar). With Schools’ Georgia connections firmly in place, the Jackmormons enlist the aid of a veritable who’s-who of side players, including Chuck Leavell (Chuck’s daughter Amy, not coincidently, happens to be the publicity director at Terminus Records) who made his name playing keyboards with the Allman Brothers, the Rolling Stones, Sea Level and Eric Clapton; Widespread Panic drummer Todd Nance and guitarist Michael “Mikey” Houser also played on the album. Houser subsequently died of pancreatic cancer, about a year after this recording began. Keyboardist Randall Bramblett (who has played with Traffic), has also played with Widespread Panic, and plays on a few tracks here. Vic Chestnutt (who toured Europe a few years back with the Jackmormons) even joins in to lend vocals to a track. And, among the dozen tracks presented here, each has something to recommend it. 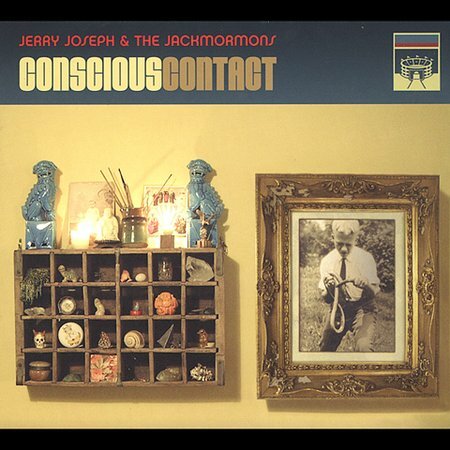 For, of the ten or twelve albums Jerry Joseph has crafted in his long career, this one is by far the strongest. Joseph’s style has always fallen into that bard-like category, like the work of Bruce Springsteen, John Hiatt, Johnny Cougar Mellencamp, an American version of Elvis Costello and Graham Parker, with his own wry worldview piercing through the stylistic similarities. The album kicks off with the jagged guitar chords of “Coliseum,” as song about Jerry’s misgivings and feelings of inadequacy, concerning a deteriorating relationship. Over Chuck Leavell‘s smooth organ fills and Rhodes-like electric piano solo, Jerry sings “Maybe she’d be better off with a gladiator/’cause glory’s just another phase I thought I’d save for later.” While it’s a very catchy song, it lacks a strong chorus to push it into the hit category. “The Kind Of Place” is an early Mellencamp sort of hoedown, with a better hook than it’s predecessor. Beneath Jerry’s scratchy vocals, Barbe’s well-placed, fiddle-like backwards guitar filigrees help to flesh out the production, as does Nance’s additional percussion and Schools’ faint keyboard layers. Very nice. Ruppel’s rubbery bass lines bounce off of Jerry’s muscular rhythm guitar, on the rollicking “Ching-a-ling,“ propelling the song like a bullet whizzing through a tenement wall. The lyrics contain several messianic crucifixion allusions, possibly in reference to the 9/11 tragedy that took place during the recording of this album. “You got stardust. You got piss and Gatorade/And you’ve got more trust in the enemies you’ve made/I got puzzles we can solve between the sheets/Ain’t no trouble to wash the blood off of my feet…/I will take you in the Shangri La suite/I will melt you like ice sculpture in the heat/I’ll forget you, but they’ll still worship at your feet/Horns of light like a Moses by Chagall/You look just right, the way you’re nailed up on my wall.” It’s a great song with incisive lyrics, bolstered by Jerry‘s fluttery keyboard figures in the bridge.. The title track, “Conscious Contact,” dedicated to the memory of Clint Ruppel, is a twangy, uptempo number, with a chromatic chord progression in the turnarounds and a strong, uplifting chorus. Barbe’s impassioned guitar solo drives the song to even greater heights. An incendiary performance of a truly affecting song. A hit song! Mikey Houser’s smoldering lead guitar work, reminiscent of Neil Young, powers the intensely moving “The Fastest Horse in Town,” a forcefully compelling song about addiction and recovery and the ‘Lost Weekend‘-like madness that settles in, between those two diametric poles. A sublimely transcendent song. A little harder to track, lyrically, is “Ten Killer Fairies,” a two-step stomp, replete with John Neff’s mournful pedal steel guitar and Rosen‘s militant drums. The apocalyptic verses give no indication as to who these “killer fairies” are, where they come from, or what their purpose may be. It’s a little unclear. The gender switch in the lyrics in the verses doesn’t help either. It’s all so confusing. Equally confusing is “Little Boo’s Fireworks.” Though the song is obviously about the purgative aspects of redemption and the need an individual feels to make something out of his life, “Little Boo” never makes a real appearance in the song (he is only mentioned), so we never find out where his box of fireworks came from, nor the true significance of setting the stuff off. But Chuck Leavell’s soulful organ pads and well-placed solo add depth to the musical arrangement. The metaphor’s are a bit mixed in “Prince Of Denmark,” where we find our Prince Hamlet courting Lady Guinevere (with Jerry in the distaff role). Where Lancelot and Ophelia are hiding is not clear. And really, these characters only serve to obscure Jerry’s meaning, which is, more or less, the observation that two together can accomplish much more than two apart. Vic Chestnutt joins in the vocal duties on “Your Glass Eye,” a modest little number about Jerry’s childhood best friend, dead fifteen years now, whose chief claim to fame was his ability to pull out the aforementioned glass eye at the most of opportune moments. Not unlike the sort of off-kilter song Randy Newman might concoct. The final track, “Easter,” doesn’t give a lot of clues what it is really about, with only elliptical references, over a thick, heavy bed of droning guitars. Jerry Joseph has finally found a band, and a producer in Dave Schools, who understand what he is trying to do, what he is attempting to accomplish as a musician. This album contains many of his finest compositions; detailing the crazy quilt that is his personal life. It is an album about transcendence and redemption. Jerry Joseph is more than qualified to discuss both subjects. And he does so very well. Seventy-year old, Minnesota-born, composer/lyricist/singer Dave Frishberg is a bit of an unknown quantity in Portland. Though he has lived here for nearly twenty years, very few locals even know his name, let alone know anything about him. This is a downright shame. For, he has (quite accurately) been compared to Cole Porter for his, witty and urbane lyrics and to Tom Lehrer for his sociopolitical astuteness. He is probably best known for his wonderful baseball song, “Van Lingle Mungo,” but there is much, much more to Dave Frishberg than baseball, as the fourteen songs presented on this album (recorded live last December in the S.H. Kaplan Penthouse at Lincoln Center, “on the top floor of Julliard School of Music” as he puts it) attest. Today’s songwriters, by and large, lack Frishberg’s vocabulary, his trenchant wit and musical chops. He’s sort of the last of a dying breed. And the world is that much the poorer for the passing of his art. 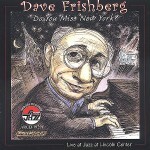 Frishberg cut his musical teeth in the ‘60s, in NYC, playing piano with such jazz legends as Bobby Hackett, Zoot Sims, Ben Webster, Al Cohn, Roy Eldridge and Gene Krupa; while acting as accompanist (and in some cases arranger) for such noted singers as Carmen McRae, Anita O’Day and Jimmy Rushing. At the same time, Dave was writing songs that were being recorded by such stellar vocalists as O’Day, Al Jarreau and Cleo Laine. Eventually, Dave convened the courage to strike out on his own, moving to Los Angeles in 1971; where he occasionally wrote scores for film and television; spending several years working with Herb Alpert. He also began to perform in cabaret-style shows as a solo act. In the ‘80s, Frishberg migrated to Portland. He has continued to make occasional appearances across the country and in the UK, for the past twenty years, though he primarily confines most of his performances to the West Coast. 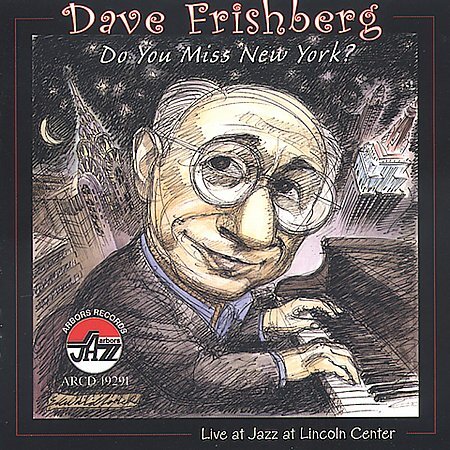 The songs he presents here, of which he wrote or co-wrote all but the classically inspired arrangement of a medley he calls “Swinging The Classics,” offer the uninitiated newcomer a clear view as to where exactly Dave Frishberg’s genius lies. It’s pretty obvious. It’s a song structure that takes one back to the age of the great musicals, written by the likes of Cole Porter and Ira and George Gershwin, Irving Berlin, Rodgers and Hart, Jerome Kern and all the rest. Dave’s piano playing is light and succinct here, with a hint of stride phrasings in the left hand: serving more to embellish than to augment. His voice, while nothing to write home about, has a certain creaky, reedy resignation about it, somewhat reminiscent of Willie Nelson- but with a slightly more cultured sensibility. Frishberg’s wry lyrical observations are brilliantly astute, elegantly constructed- and deadly accurate. “We’ll take a seminar on self-hypnosis/So we can learn to stop and smell the roses/We’ll do a workshop on the grieving process/ Learning to cry is no crime/We’re talking quality time.” His is indeed a dying craft. “I Was Ready,” with it’s hookline of “I was ready for her, she wasn’t ready for me,” continues in the 21st century love song mode. But “Jaws,” is the unused theme song for the movie- a song that really has nothing to do with the film, whatsoever. The opening refrain of “Do You Miss New York?” tells the whole story. A fairly straight ahead number, “Little Did I Dream,” offers Dave the occasion to display his considerable talents as a jazz pianist. Similarly, but in a different way, “Swinging The Classics” offers him a similar opportunity. He plays familiar classical pieces with his reference being from the jazz interpretations he grew up with, rather than the traditional settings. “Zanzibar” is another, more mainstream number. “The Hopi Way,” amusingly explores some sort of outlandishly repressive philosophy, with interesting results. “The Difficult Season” examines the downside side of the holiday season, with effectively depressing results. Do not, under any circumstances, listen to this song during Christmas. Dave’s spoken introduction to “Eastwood Lane” gives an extra layer of meaning to the pretty ballad. Dave Frishberg, displays a command of the English language rarely seen among today’s songwriters- who typically rely on cliché and banality in order to cobble together a lyric. Frishberg’s musical chops are above reproach. He brings with him musical sensibilities and talents which now seem very far away, receding into the mists of time. And that’s an outright shame. Think of Gordon Gano (vocalist of Violent Femmes) fronting Adrian Belew-period King Crimson. Think of Captain Beefheart’s band of the mid ‘80s, without Don Van Vliet singing). Think of all the original British proggers, such as Gentle Giant (oddly enough, there is a song called “Knots“ on Gentle Giant’s ‘72 release, Octopus), Wishbone Ash, Jethro Tull, Yes and Genesis. Having moved to Portland from Chicago, by way of Olympia, guitarist/vocalist Joe Haege (who also plays keys and adds samples to the mixes) and bassist Jay Winebrenner have worked together for over a decade. Drummer Jay Pellicci, who joined the band in February of this year (former drummer Joe Faustin Kelly plays on four of the ten tracks found here), has played with Dilute and The Natural Dreamers. Jay Pellicci, along with Ian Pellicci, engineered this album, ostensibly the band’s fourth. The material ranges from the Yes meets Crimson fugue of “A Half-Life in Two Movements” to the acoustic subtleties of “”Without Wine,” the urgently frantic edge of “No Sound,” the epic majesty of “At Peace,” to the electronic underpinnings of “Matter From Ashes.” But what is apparent after even a single audition of this album is that it is a very clear and obvious record of a band in transition. The passing of the baton from Kelly to Pellicci is more than simply a symbolic gesture. There is a definitive shift in the musical perspective going on here, which becomes palpably evident as the songs go by. 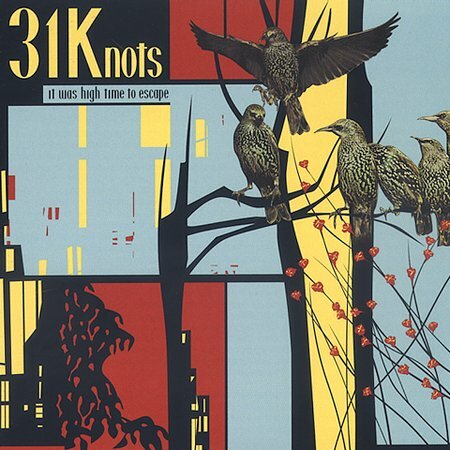 Sort of an updated, rewritten version of Traffic’s classic “John Barleycorn (Must Die),”with similar vocal harmonies, “Without Wine,” is a low-key folk-ish song, in this case the story seems to revolve around a situation where a lack of “gold” for “wine,” and the lack of motivation to remedy the situation- metaphorically representative of our everyday inaction in the face of the pressing demands of our immediate needs. “John Barleycorn” indeed! A pretty, piano arpeggio decorates the final moments of this unusual song. Lastly, “Matter From Ashes” whirs and whizzes with electronic sounds looped into a limping beat; before the dust settles and a more regular rhythm develops, allowing the band to expostulate in a sort of moody, Pink Floydish way. Angelic harmony vocals flute majestically, until Pellicci motivates the band one last time to explode with emotion, before succumbing to the robotic beat as the song fades. 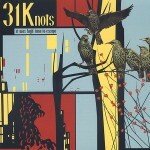 The members of 31 Knots display keen intellects and muscularly dexterous musical capabilities, which enable the band to carve out an uniquely complicated sound- one which boils with electrical intensity; while formulating and framing the ultimately vital questions, which invade their individual psyches with persistent ambiguity and inspiring introspection.